Price: Member Early Bird (ends 6/15/19): $295, Student Member Early Bird: $175, Regular Member Admission & Day Of Registration: $310, Student Member $210. Single Day admission will be available to purchase on-site, day of the conference. Mark your calendar for the highlight of our year! The CoMA Annual Conference has been going strong since the organization was founded. 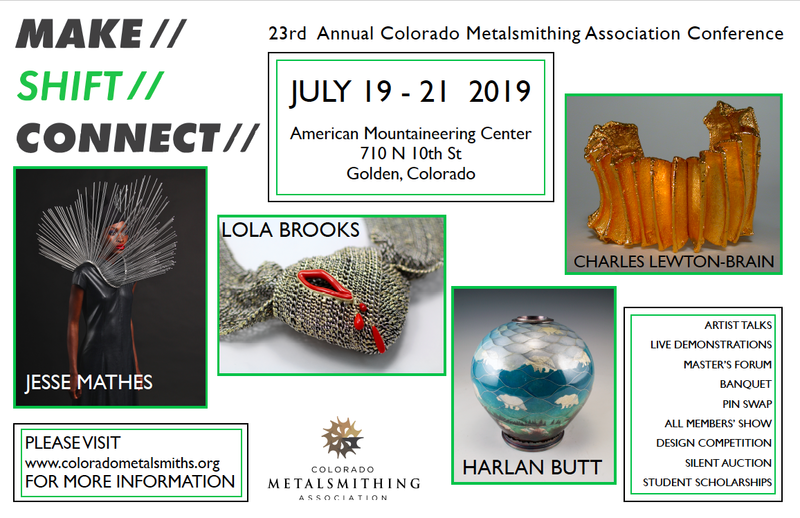 The Colorado Metalsmithing Association is a 501(c)3 Nonprofit, and has been going strong for over 20 years, with the annual conference being the highlight of the year for all of our members. At this event, we will be hosting four different metalsmiths who will all be giving artist talks, and live demonstrations. We will also have a Masters Forum-- which is a Panel Q&A Session with our presenters. There will also be a vendor area, silent auction, pin swap, banquet & cocktail hour, live band, and so much more! This educational and fun conference is not one to miss! 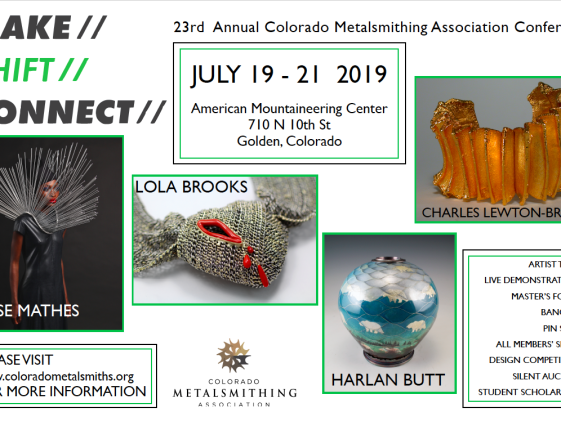 Our board of directors and hard-working volunteers are dedicated to bring together world -class presenters in an intimate and fun atmosphere that is conducive to learning and connecting with other metalsmiths. Early bird registration open now through 5/31. Early bird registrants receive the 2019 Conference Exclusive Tote Bag. After 5/31, rates will increase. Rates will remain the same as last year. Aspiring Metalsmith Scholarships available - visit website for details!